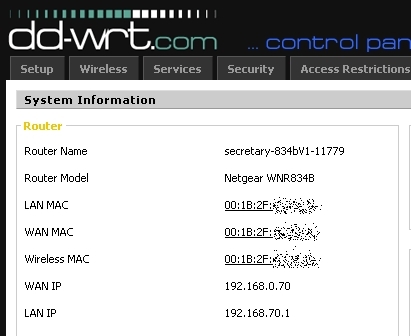 DD-WRT Forum :: View topic - WNR834bV1 (V1 only) revive router's MAC address. WNR834bV1 (V1 only) revive router's MAC address. Posted: Sun Mar 22, 2009 21:05 Post subject: WNR834bV1 (V1 only) revive router's MAC address. OK all....I received a WNR834bV1 as a donation...it was bricked when it arrived. It was upgraded from NG firmware to Sveasoft's Talisman firmware...but in the process...it bricked and the owner didn't want to deal with it....so it was provided to me. As I have always said...any donations are put to use for the dd-wrt project and this one was no exception...so here is my donation in the form of info to get your MAC address back to its original and not the generic 00:C0:02:63:00:08 address. I read A LOT of information to come up with this solution...it was spread far and wide in our forum and at various placed on the www ....but here is the process that worked for me to regain my MAC address for the WNR834Bv1 unit. A word of warning....this router does NOT have JTAG...so it is not an easy unit to debrick if somethings goes wrong...if you haven't had problems with the default MAC address...then don't attempt this. You may want a Serial level converter cable for this process....it helps to see what is going on with the CFE. This overwrites your CFE with the edits you just made....now power cycle the router and let it boot up. 3 - Start a dd-wrt flash from the router's web gui...but unplug it in the middle of the flash to corrupt the flash....unless the flash is corrupt...the CFE won't accept the original .img file in the next step. 5 - Once the NG firmware is loaded you can use the Firmware update tab in the NG web gui to load a special .img build of 11580_mini firmware (provided by simri in this post.... http://www.dd-wrt.com/phpBB2/viewtopic.php?p=260792#260792 )...also provided below. This is the method I used to completely revived my new toy...Please if you attempt this process and you find an error or find an alternate method...please inform. A big thanx goes to Simri, sparkie, Tornado and Eko...I learned a lot from you guys in the various threads that I read through. Also a Special Thanx to jalanmac for the donation of the router. Notice MAC is not the old 00:C0:02....value. So, you used a serial cable to read the console output and determine what caused the brick? Actually...no - I never determined where the problem was...I put the serial console on but the only thing it told me was that the firmware was corrupt. The CFE then halted the boot process. I just did an "nvram erase". from then on it booted up into the Talisman 1.3.1 build. Impressive work, as always, Red. Posted: Tue Oct 27, 2009 2:54 Post subject: Re: WNR834bV1 (V1 only) revive router's MAC address. @ Redhawk.... I am fixing this device for someone I work with. Had to replace three puffy caps and the unit fired up.. I should'a left well enough alone. I extracted the cfe with dd-wrt running. It is 128K, please confirm. My question is your syntax.. I only got one shot at this I expect and I want to make sure I have either spaces or no spaces in the command. an underscore " _ " will be a space ok? What does the -f do? The stock .img file, you can rename it to a zip file, then extract the image which is a bin. This file is supposed to contain both the cfe and the firmware image. Looking at it, I believe it does. Then you can use a hex editor and delete all data from the beginning of the file up to the header of the firmware image which is HDR0. Then save the file. Now you have the stock netgear firmware that is a bin. Has anybody tried flashing this bin through the dd-wrt gui to revert? Trying to flash the raw .img file, dd-wrt won't take it. Says it has to be a bin. Renaming the .img to a .bin, blows out with a flash failed. I'm a little uncomfortable pulling out the power plug in the middle of a flash to corrupt the kernel so the netgear will allow a flash of an .img file via tftp. I've done all the steps in regards to changing the macs in the cfe and extracting the bin from the img and editing it from the 1st byte up to HDR0. Not really ready to pull the trigger flashing it via dd-wrt gui. I can find no information about this device except what is in the wiki, and Red's post(s). Any thoughts or experience with this idea? Yes...it works...but you must use the netgear WW file...not the NA file....here is a revert file. Flash it from the web gui. Thanks.. 1st.. what does -f do? -f forces the write...I believe the problem comes in if there is an error...it continues to write anyway. It was recommended to me that it NOT be used. Good find on the Yellow light....that light actually can be any of 3 colors....Green, Yellow, Amber. I was wrong about the light. I got the cfe flashed, the macs straightened out, etc... Running dd-wrt, the internet light is amber, stock firmware it is green. Running dd-wrt with the amber light, there are no ill effects. I have a wan connection, the light flickers with activity but it is amber. As said, stock firmware it is green. I have flashed back and forth a few times to make sure.. Yes.. hard resets and so on. On this box, dd-wrt has an amber light, stock it is green..
No big deal.. I am returning this box to the owner with the stock firmware. I would rather see the devs fix up the problem I have with wl1 on the 610 than worry about a gpio with a 3 year old router.. I have a gazilloin (that is a lot of zero's) pages of linux commands.. never found mtd. There is mt (mount).. In screwing up the syntax on a command, a help screen popped up (thank goodness). Where does one find this information? Over the months, with help from the forum, I figured out how to flash a kernel via serial. Again, with additional help from the forum, I have now flashed a cfe via telnet. Where can I find this info so I can be the "helper" as opposed to the "helpee"? I am very greatful for the help, support, and talent on this forum. Without hesitation, I can say that this is the best technical forum in regards to this project, in the world! Something still isn't right...I have the exact same model WNR834b (no designator...it's a V1...no JTAG)...but with stock or dd-wrt FW, my power LED is Green when all is working correctly. there is some (although limited) info on the web for mtd command...I did a google search and found some info...but you're correct...the info seems to be very illusive. my power light is green after it boots. It is the internet (wan port) led that is amber (with dd-wrt). Possibly with dd-wrt it changes color based on connection type??? That would explain it. I thought you were refering to the Power LED...that one is Tri-Color...the WAN LED is most likely Bi-color.